“You might be able to buff up an old pair of boots but you just can’t polish a turd…” ~ R.T.
On April 20, 2018, Ryan Zinke was returning to Washington from an environmental conference in Texas. During the first leg of the trip, on a flight from Dallas to Atlanta, the then-Interior Secretary had an auspicious seatmate, an investor with a checkered legal past and a new company focused on blockchain technology. Whatever was said must have impressed Zinke. Less than a year later—just weeks after he left the Interior Department—he joined Cannon’s company. On Monday, Cannon’s investment banking and blockchain advisory firm, Artillery One, announced in a press release that Zinke was coming on board. The former interior secretary, Cannon told The Daily Beast, will provide “analysis” of pending legislation and regulatory requirements and receive “C level executive compensation” for that work. Such policy advice, and a correspondingly sizable salary, are typical of post-government jobs for high-ranking administration officials who leave for the private sector. But Artillery One, which describes itself as “a unique and sophisticated FinTech consulting company whose principals specialize in all forms of finance, crypto finance, investment banking and cybersecurity,” is not a typical cash-out opportunity. Nor is Cannon a typical executive. His registration profile with the Financial Industry Regulatory Authority, a private financial watchdog group, is littered with red flags. They include criminal charges for cocaine possession in 2008—dismissed on the condition that Cannon receive substance abuse treatment—and possession of controlled prescription medication in 1995, which was also dismissed after Cannon agreed to serve two years of probation. Cannon’s in-flight conversation with Zinke last year came shortly after a major Artillery One deal fell through. The company had stepped in to bail out a struggling Swiss blockchain company, offering just over $2 million to acquire the firm Monetas. But the deal fell apart after Monetas claimed Artillery One had only ponied up $400,000, and Artillery One insisted it had been misled about the scale of debt on the books of its acquisition target. Nonetheless, Artillery One maintains business relationships with other companies, with an apparent focus on blockchain firms in Kosovo, where cryptocurrency businesses have soared in popularity of late. A cached version of its website, which was not available immediately after the announcement of Zinke’s hiring, lists two companies run by Kosovars, Sentry Cybersecurity and Bitsapphire, as “strategic alliances.” The press release announcing Zinke’s hiring listed a press contact in Kosovo. And Cannon himself appears to keep an eye on political goings-on in the Balkan nation. As part of his new position at the company, Zinke is slated to attend the Crypto Finance Conference in St. Moritz, Switzerland this month. But his utility appears likely to be more as a D.C. operator than an expert on the technology underlying Artillery One’s business. Zinke’s hiring, it appears, is geared towards expanding Artillery One’s ability to connect with members like Brady and navigate often complex and evolving financial regulations. But in Zinke, Cannon is getting somewhat damaged political goods. The former secretary’s tenure at Interior ended amid a host of active investigations into his conduct, including one probe that was reportedly referred to the Justice Department, which can be a precursor to criminal prosecution. Some of those investigations revolved around Zinke’s travel practices, including a habit of bringing his wife along on taxpayer-funded official business trips. It was not immediately clear whether that fateful flight from Dallas to Atlanta was one that has come under investigative scrutiny in the months since. But Zinke will likely have opportunities to take many more flights alongside Cannon. Nice to know Zinke found a place to land – altho does NOT sound like hes coming up smelling of roses! I hope he is charged with sending thousands of Wild Horses to slaughter, he has blood on his hands. People who are involved with so much torment, killing and horrified people never fare well in the end. His Callousness was evident throughout the two years he was in charge. Isn’t there a law or two about former government employees being prohibited from lobbying (or similar) for five years after leaving for the private sector? Since the realm of finance is not Zinke’s forte, it seems his usefulness would only be for access to government officials (i.e., lobbying for profit). He’s also not quite an expert on avoiding legal or ethical entanglements, as is well known. “I’ve done this long enough to know we need to save money for these kinds of things,” said Kerry Despain, the plain-spoken owner of an 800-acre ranch in rural Axtell, Utah, that houses about 1,500 wild horses BLM has rounded up off of federal rangelands. 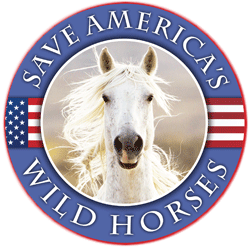 Many of the wild horses on Despain’s ranch were rounded up from BLM’s 267,000-acre Sulphur Herd Management Area in western Utah and brought to the ranch, presumably to be offered for sale or adoption. Despain, who owns the ranch with his wife, Nannette, is under contract with BLM to feed, water and care for the 1,500 or so wild horses. That’s a lot of mouths to feed, and Kerry Despain said the federal checks stopped coming last month.